I want to start this article by stressing that there are literally thousands of ways to set up a planted tank. This is just one, fairly simple way to get a system that will work and work well if you follow the instructions. It doesn’t mean you have to stick rigidly to the equipment stated, but the set up detailed below is an easy to set up version of ones used successfully by members of UKAPS. A decent sized tank for relatively stable conditions. T5 lighting of at least 2 watts per gallon with good reflectors. High levels of flow and filtration (at least 10 times the tank’s volume). CO2 at 30ppm during the tank’s daylight hours. A nutritious substrate with regularly water column dosing. Dense planting from day one. Algae eating fish and invertebrates added once the tank is mature. Lower stocking levels than a standard tropical tank. Disclaimer: All the links below are used to illustrate the items and, while most are places I, or other UKAPS members, have used with good results, but we, in no way, promote or offer any kind of recommendation for these sources, nor will in any way be liable if problems are encountered. You may be able to purchase some of these items cheaper from other sources. This article is based around a three foot tank, about 40 gallons (36” long by 18” tall by 18” wide). The tank can be of any make, either with a traditional kind of tank (with stress bars, cover glasses and a hood) or a rimless tank and the instructions vary slightly for these below. This tank is taller and wider (and more expensive) than a standard 36” long by 12” wide by 15” tall tank but the extra height and width allow far more scope for designing and getting good flow around the tank as well as giving more volume in the tank. For slightly different dimensions you may need to adjust the equipment accordingly. This is approximately the same size as a Juwel Rio 180 and these now come with the High-Lite lighting and are an excellent choice, if you like the cabinets. Good lighting is essential to a planted tank and, as a higher tech planted tank you will need at least two full length T5 bulbs with good reflectors, preferably gull-wing for maximum efficiency. This will grow Glossostigma and Hairgrass well as carpets and provide enough light for almost any plant you would wish to grow. If you have a tank with hood then you can get an Arcadia T5 twin 39W controller two 39W T5 bulbs from Lampspecs and D-D gull wing reflectors. A recommended combination of bulbs is one Sylvania Grolux and one Osram Lumilux T5 880 Skywhite (see James’s thread for more details) but the colour is mainly for our benefit; the plants don’t really care. (Make sure these bulbs will fit whichever hood you have on your tank). A Juwel tank with High-Lite units will provide enough light, coupled with good reflectors (D-D gull wing reflectors just fit and are excellent). If you have a rimless, open-topped tank then you will need a luminaire. These have four T5 lights and either sit on legs or are suspended by cables above the tank. The higher lighting is fine, but you may need a shorter day length at the start or to stagger when the lights come on and go off (see below). Use timers to make sure your lighting comes on and goes off at the same time each day. This will give a regular photoperiod for the plants and fish and will help prevent over-doing the light. Start with 10 hours if using two bulbs. If you’re using a 4 bulb luminaire then have two bulbs come on for 6 hours; 4 hours in have the other two come on and then have them go off 6 hours afterwards. This will give you a 10 hour ‘day’ with a two hour blast at midday. Get good timers as cheap ones invariably fail. In my opinion digital timers are best as they are much easier to set to the same time than analogue ones and get all the different timings co-ordinated. After lighting this is the most important key to success in a planted tank. Adding pressurised CO2 from day one will mean the plants grow away strongly and help keep algae at bay. A ready-made kit that will do well on a tank this size (and fit easily inside a cabinet) is a JBL Easy 2 with disposable CO2 canisters. However any pressurised CO2 kit will do a good job. A much cheaper option than the ready-made kits is to use a CO2 Fire Extinguisher with a cheaper regulator from somewhere such as Ebay. See Sam’s excellent tutorial on this for more details. Do get a unit with a solenoid. This allows you to run CO2 only during the day and also means the CO2 is shut off when there is a power cut. This can save a CO2 over-dose in such an emergency. Set the CO2 to come on half an hour before the lights come on and go off just before the lights do. This is done by plugging the solenoid into an ordinary domestic timer just like the lights. For CO2 diffusion use a glass CO2 diffuser. For this size tank a Rhinox 5000 is the perfect size. It is slightly larger than needed but fairly unobtrusive and produces fine bubbles. You will need CO2 proof tubing if your kit doesn’t come with it. CO2 needs to be measured using a drop checker and 4dKH water. I am colour blind and find the JBL permanent CO2 and pH test much easier to read than the glass drop checkers, but not as aesthetically pleasing! A good planted tank, in my opinion and experience anyway, needs a good fertile substrate. A substrate that supplies nutrients to the plants can act as a ‘safety buffer’ if you aren’t always consistent with your daily dosing and will allow some room for the errors that are all too easy if you’re starting out in this kind of planted tank. I recommend ADA Aquasoil Amazonia. It does come in other types (Malaya and Africana) that are in different colours and slightly different acting. There is one real problem with Aquasoil in that it will add ammonia to the water at first which means it will take longer until you can add fish. This will mean that you need to run the tank without fish for longer, but it’s worth it in the long run as the plants will thrive and then provide an excellent home for your fish. You will need enough Aquasoil to give a decent depth and two 9 litre bags should be just enough. You may want to add Powersand Special under the Aquasoil, but this is optional. If you know you will forget to dose regularly, adding a 2 litre bag for every 9 litres of Aquasoil under the Aquasoil is a good idea. It provides more nutrients to the plants. Aquasoil is expensive and there are other substrates that will work well too but they don’t supply the same kind of macro nutrients (Nitrogen and Phosphorous) that Aquasoil does. This means you have to be much more careful and regular with your dosing in my opinion as they won’t act as the safety margin to irregular dosing I talked about earlier and will talk about more later. Fertilisers need to be added to the water column, ideally daily to supplement the nutrition in the substrate. If you don’t do this your plants will not thrive, but the Aquasoil means missing a day, or even a week doesn’t seem to make too much of a difference (just don’t do it too regularly!). If you are a complete beginner and want a very simple option then Tropica’s Plant Nutrition + will give all the fertilisers you need for the plants. According to Tropica’s instructions this should be dosed at 5ml per 50ml each week, however in a tank such as this with rapid growth rates you will need to dose more and more often. UKaps members have found that dosing about 5ml per day per 100litres works well. For this tank I would start with 5ml per day (in 180 litres) and then increase the dose as the plants grow up to 10ml per day in normal running. This must be in conjunction with 50% weekly water changes and 30ppm CO2. However this regime is more expensive than the alternative. This is getting the dry powders and mixing your own. You can find, on our forum a recipe for doing this into one mixture, but much more simple is to make two solutions and keep them separate. You can dose both at the same time though, as once they mix in the tank they are so dilute it won’t be a problem in my experience. The recipes are based around the EI method of fertilisation, but I keep these a little more simple and get great results. For every 10 litres of the tank water, I add 1 ml of the micro mix and 0.5ml of the macro mix every day. For this sized tank, that means I dose 18ml of the Micro mix and 9ml of the Macro mix daily. I am rarely remember to dose this daily though but Aquasoil is the key, I believe, to this inconsistency not meeting with disaster! The more regularly you add your fertilisers the better the results you will see. When starting my tank I dosed half these rates and increased as the plants grew (just like with the Tropica fertiliser above) but I’m not sure this was necessary. The other ‘fertiliser’ I recommend you use is either Excel or EasyCarbo. These are liquid sources of carbon that plants can use directly from the water. They also kill off algae and so are very useful in the initial stages of a tank, or when the tank is disturbed in any way. They almost act like another safety barrier to problems, like the Aquasoil. I add double the dosage rate daily in the first few weeks (7ml in our 180 litre tank), and then only dose after trimming, water changes, filter cleaning or if any algae (apart from the green spots on rocks and the glass) is seen. If any algae is seen the daily dose can be squirted directly over the algae using a syringe which is very effective at killing it off. You need to make sure you have a high turn over of the water in a high tech planted tank. The ideal (zenith almost!) is 10 times the tank’s volume, but less with a good external filter will be ok. This does two main things; it helps to keep debris in the water in suspension (so the filter can remove it and it won’t trigger algae) and it ensures that CO2 and other nutrients are evenly distributed all around the tank so all the plants thrive. 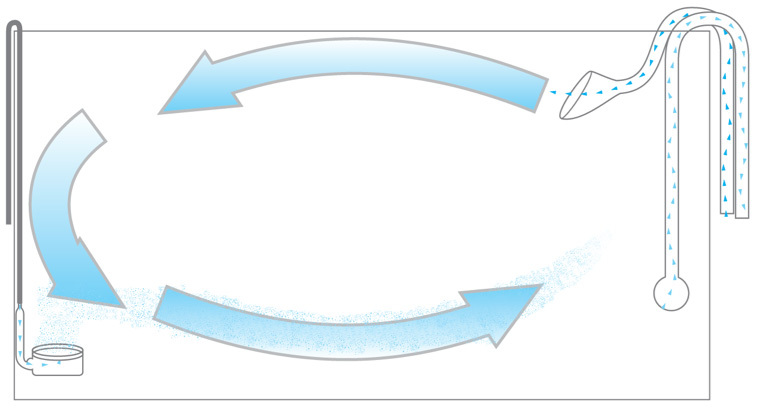 (See Nitrogen Cycle section below for more details). You also have to make sure that you filter the water very effectively. A, if not ‘the’, major trigger of algae are organic wastes. These are produced from your fish wastes, uneaten food and dead plant bits and you need to keep them to a minimum to prevent algae. The best type of filter to get is an external, canister filter. These types of filter mean that there is a lot less equipment in the tank and also that you can put things like the heater (see below) outside the tank too. You also don’t disturb the tank as much while cleaning. Most importantly external filters have much larger media volumes than most externals to help keep organic wastes down. For our 180 litre, 40 gallon, tank, 10 times the volume would mean a filter that circulates 1,800lph. If you tried to do this with one filter then you’d need a top of the range filter from the Ehiem 2080 or Fluval FX5! In reality you can get away with one large filter such as an Ehiem 2028 or equivalent sized filter in another range. This filter will circulate the water 5 times an hour and do a very good job IME. 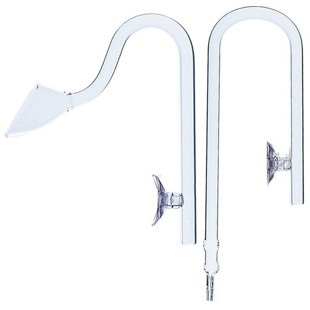 If you already have a smaller filter (such as the Juwel internal filter) then you can remove the current filter and replace with a larger external model as above; add an extra filter or add a circulation pump to improve the circulation. The Hydor Koralia pumps have a very high flow rate, but this is with a low velocity and the big advantage of these is that they can be turned off at night when CO2 is not running and plants are not photosynthesising. It also gives the fish a break! However, if you stock your tank heavily you should get another filter instead of the circulation pump as you will then need the extra filter capacity to remove any traces of organic wastes. You will need to run extra external filters 24/7, not on a timer, so the biological filter continues to function. If you retain the Juwel internal filter, I would replace the bottom sections of media with a sintered glass media as these have a much higher surface area than the foam supplied. Keep some coarse and fine foam in the upper part of the filter as your mechanical filtration to remove debris from the tank. If using a rimless tank then you may want to look at glass lily pipes for a more aesthetic effect and good circulation. If you have the Juwel internal filter then the heating is already catered for in there. If you are using an external filter then an external heater, such as the Hydor external heaters, fitted to the return pipe will do a great job and keep the equipment out of the tank. Any heater/thermostat will work fine though. Set the heater to about 26 degrees centigrade, but this is dependant on the fish and inverts you choose to stock more than the plants and you will need to research and find out the best temperature for them. As for heater cables; save your money. They may have a marginal benefit in cold rooms, but for the average home and with Aquasoil substrates they are not required. They may even cause more nutrients to come out of the substrate. If you look in any good book on fish keeping there will be a section on the Nitrogen Cycle and how your filter encourages nitrifying bacteria to work biologically to remove ammonia from the water and convert it into Nitrite the Nitrate which is safe for the fish. They probably then go on to say how high levels of nitrate will cause algae and need removing through water changes. Organic wastes, including ammonia, are produced by the decay of dead plant and animals, uneaten food (of which there should be none in your tank) and the wastes fishes produce (both the solid wastes you can see and liquid ones you can’t). These need limiting as much as possible in the high tech planted tank as they will trigger algae. The chemicals themselves, added to your tank seem to work differently to those produced by living organisms and will not produce algae in a planted tank with good plant growth. However adding too many fish, forgetting water changes, over-feeding or not having a large enough filter will cause algae sooner or later. To help your tank mature more quickly, if you can, add mature filter media from a tank that is already set up. If you have another tank this is easy, just move some media across, but if you don’t see if anyone near you can help. Other wise a bit of patience will mean your tank will mature well, just don’t rush things here. If your tank isn’t mature and you add fish then you are doubling potential problems, as well as endangering the fish. If in doubt or things aren’t going perfectly then wait! In our tank we need to make sure the filter is cycled and converting ammonia as soon as possible as the one drawback with Aquasoil (apart from the price!) is that it will leach ammonia into the water. This can kill fish if you add them too early and cause algae, which is one reason why you need to do lots of water changes when first setting up this tank. (see below for more details). 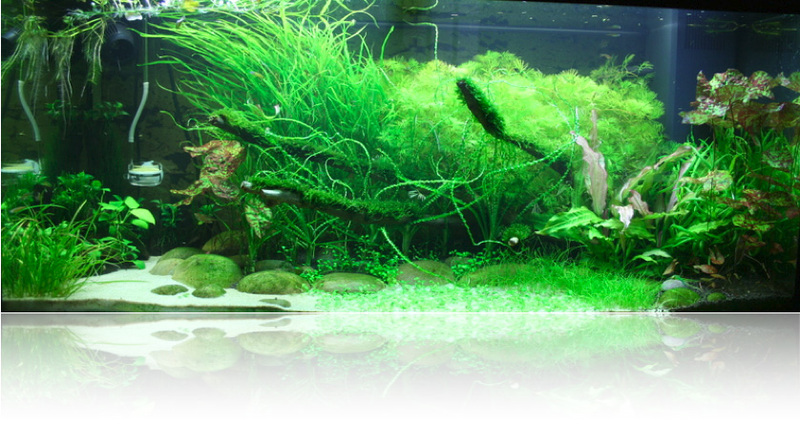 For more details on actually setting up please see the various journals on the forum (Journals, The White Room and Aquascaping). My own Rio 180 thread details the use of Aquasoil and Powersand Special in a Rio tank with the modifications detailed here. Basically add the substrate, set up the filter, lighting heating and CO2 as per instructions supplied. If the manufacturers instructions aren’t clear and you have any questions with this please post on our forum. As to positioning, you need to make sure that your filter is set up to circulate the water as effectively as possible. Although it may seem counter-intuitive, with an external filter this is best done by placing both inlet and outlet in the same corner! For an external filter this should be one of the rear corners. Position the outlet to force water along the back of the tank and then it will flow all the way around the tank, along the front and back to the inlet. The CO2 diffuser needs to be placed a couple of inches above the substrate in the opposite corner where the flow from the filter will hit the end of the tank and some will be blown downwards. The other option is to place the diffuser underneath the intake to the filter. This will mean the micro-bubbles are taken into the filter where they should dissolve before reaching the filter itself. HOWEVER this goes against the recommendations of most filter manufacturers and you do so at your own risk! Now you need to plant and decorate your tank. Aquascaping is beyond the remit of this article so please read George Farmer’s Aquascaping basics (Part one, Part two and Part three) in the Aquascaping section of the forum. Or, as a start, try and copy the plants and hardscape (wood and rocks arranged in the tank) you’ve seen in another tank – imitation IS the sincerest form of flattery! The ADA catalogues are excellent sources of inspiration. 1. Do make sure any wood you use is not still rotting and adding lots of organic wastes to the tank. I suggest, at first, buying wood, such as Redmoor wood or Sumatra wood that others are using successfully or sticking with rock (do use real rocks though, not the artificial ones!). A lot of so-called ‘bogwood’ is not and will decay with moulds and bacteria growing on it. This is not a good sign and shows the wood is still decaying and really unsuitable. 2. Do plant very heavily from the start. Do not fill or light your tank until you have the plants. You also need to start with lots of fast growing stem plants. As you look down on the tank you should barely be able to see any substrate! Ideal fast growing stem plants include Hygrophilas, Cabombas, Ludwigias and Rotalas. Also rapid carpeting plants such as Hairgrass and Glossostigma are good to use. Once your tank is established you can replace these with slower growing species or trickier ones to grow. 3. Do change lots of water. At first replace 50% every day for a few days, then every other day. After a couple of weeks you can slow this down as long as you don’t see any algae (other than a few green spots on the glass – this is perfectly normal!) or dirt building up. It is important to keep up large water changes every week. With the recommended EI fertilisation you need to do 50% water changes every week on this tank. These will remove any organic wastes building up in the water as well as keeping the tank looking sparkling! 4. Do keep the filter clean. If in doubt, clean it out. You will soon learn how often it needs to be done, but you can’t clean the mechanical sections (foam and floss in most external filters) too much or too often. Don’t clean the biological media in anything other than old tank water though. This will mean you don’t kill all the filter bacteria. Tap water, with chlorine will rapidly kill them and lead to dangerous ammonia levels like in a new tank (see Nitrogen Cycle section above and below). 5. Don’t add fish until nitrite levels are 0. This is the only time you should need to use a test kit (honest!). You only need to test for Nitrite as that will only occur once the filter breaks Ammonia into Nitrite, then into Nitrate. If you add fish while ammonia and nitrite are detectable by a test kit then you will harm and potentially kill your fish. Don’t believe the shops who say to stick some hardy fish in almost immediately; they may survive but why do that to a living creature when you don’t need to and it will encourage algae? In a tank with Aquasoil this can take over three weeks. Don’t panic and don’t rush this stage. Adding fish too early will cause algae and may kill the fish. You should also make sure you are happy with getting good CO2 levels and dosing before you add the fish. If in doubt take an extra week; your fish, and the plants and tank, will thank you! 6. Do add lots of algae eating fish and inverts. In my 180l tank I have 5 Otocinclus catfish (the best algae eating fish in my, and many other people’s, opinions) and more shrimp and snails than I can count. The snails are Pond and Ramshorn snails and the shrimp are a kind of freshwater algae eating shrimp. If you add Cherry shrimp, rather than Amano shrimp they will breed and you will soon have lots! Leave the more delicate Tiger, Bee and Crystal Red shrimp until you’ve had a bit more experience or your wallet, and the shrimp may suffer! And NEVER use medication with copper in it or you will kill your shrimp in hours. I added a piece of wood from a tank where I had dosed copper once and the shrimp were dead the next morning; they are that sensitive to it. 7. Don’t overstock with other fish. Start with a large shoal of small fish. If you want your tank to look bigger than it really is adding 20 tiny fish will look much more effective than 10 mid-sized ones. 8. 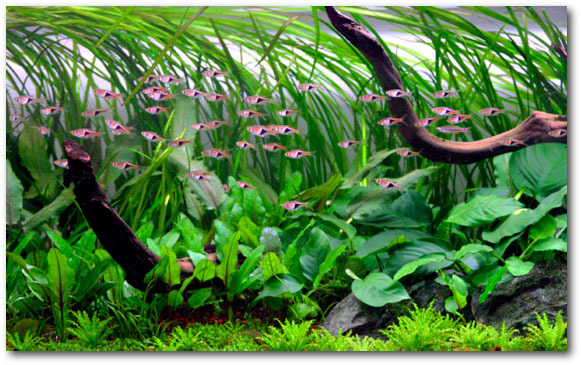 Do sit back and enjoy (just don’t forget the dosing, feeding, filter cleaning and water changes…)! Please note these shopping lists only provide potential links to the items, it does not mean these are the best or only sources. If you want a wide range of suitable products please visit two of our sponsor’s sites, Aqua Essentials and The Green Machine, but there are many other possible sources.